Update (November 2013): Following really helpful comments from a number of people, I've refined the theory further. Please see the most updated version of the paper at SSRN. Update (6 May 2012): I've updated the framework a little since I first wrote this post. I've refined the focuses on majoritarian vs. consensual systems rather than fairness. Please see the most updated version of the paper at SSRN. 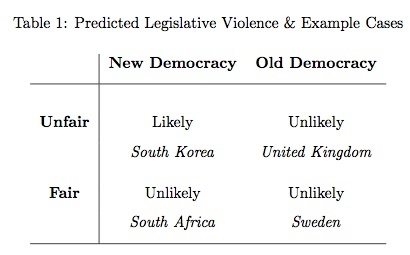 My main findings are that new democracies and unfair legislatures are more likely to have violence. 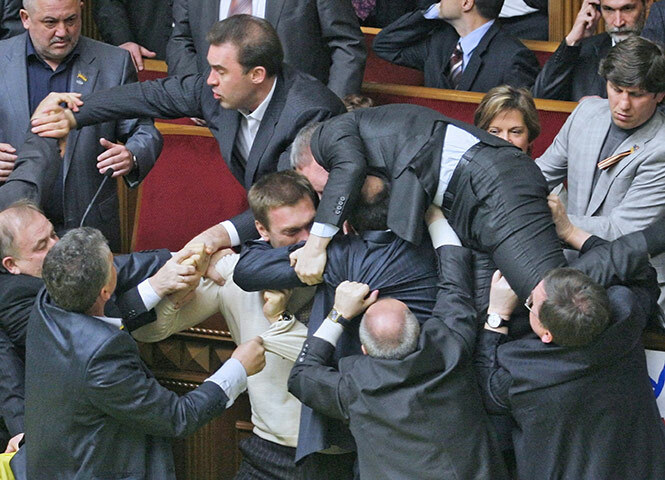 Legislative unfairness means that the allocation of seats is disproportional and a smaller proportion of legislators are part of the governing majority. In new democracies losers many not have developed a reasonable expectation that they can become winners some day. 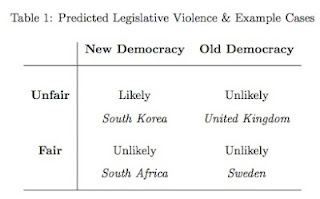 Unfair legislatures both increase the proportion of legislators that are losers as well as heightening their sense of loss. 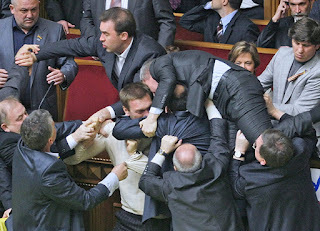 For example, if your party wins 30% of the vote but only 20% of the seats and that 10% means the difference between being in government or out, you might be rather irritated and maybe more likely to attack governing party legislators who try to pass a piece of legislative you really dislike. Here is a summary table from the working paper of my framework and some illustrative examples. I have some interesting graphs in the paper and plan to discuss how I made them in future posts.